Danini is an 11 year old boy. His parents have divorved and moved on, and he lives with his grand mother, who sadly is mentally disabled and poorly equipped to look after him. Relatives in the village feed Danini but he does not have even the basics of life. It is a tragic situation. 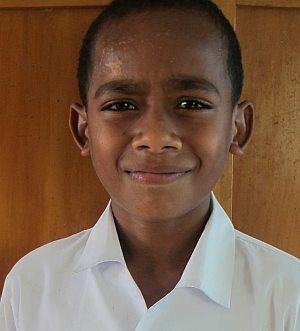 Danini travels to school each day on foot, and his favourite subject is English. When he is not at school he collects firewood for cooking. When he grows up, Danini wants to be a professional rugby player. Danini urgently requires support as he has no one providing for him. Danini is attending Class 5 in 2014. Sponsored by Cath, Laura & Chris.